Motorists travelling into central London face a £5 daily charge as the capital's congestion charging scheme comes into force. The scheme designed to alleviate traffic gridlock in London is the most ambitious ever undertaken by a capital city and its success is being watched closely by cities across the UK. As the charge launched at 0700 GMT on Monday, there were no early signs of the feared traffic chaos or major public transport problems. This was partly due to lighter traffic during the half-term school holidays, according to motoring organisations. Up to 30,000 drivers were expected to leave their cars at home and find another way into central London. London Mayor Ken Livingstone, speaking from the traffic control centre, said: "I'm just waiting for something to go wrong." Any motorists not paying the £5 daily charge, which operates 0700-1830 GMT weekdays, risk being caught on cameras and fined £80. Officials from 30 other British cities, including Edinburgh, Cardiff, Belfast, Leeds and Bristol are also considering introducing congestion charges. 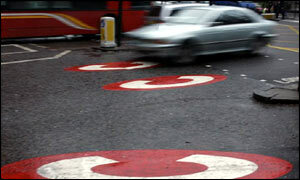 By 0630 GMT, more than 30,000 people had already paid the congestion charge for Monday and 50,000 had registered to pay by text message. Mr Livingstone, who is gambling his political career on the innovative scheme, said it would reduce traffic and raise millions of pounds every week to re-invest in transport. But he warned of a "bloody day" on Monday. "If there is a collapse at the call centre or if there is gridlock then clearly the system will have failed", he said. However there were also no reported delays on the Transport for London congestion payment phone line. The mayor expects they will know if the scheme is working by Easter. BBC News Online's Tom Geoghegan found his journey by car from Croydon into Oxford Circus trouble-free and he arrived within 45 minutes. Having failed to be able to pay his £5 charge in his local newsagent, he intends to pay online. An RAC spokesman said: "There was not the anticipated early rush of motorists attempting to get across the zone before the 7am start. "Neither is there increased traffic around the periphery of the zone." Protests against the scheme are being held. In Kennington, south London, a handful of demonstrators took part in a protest organised by local Conservative councillors. Driver Stuart Cutts said his fruit and vegetable delivery business would have to close. "We are based in Hertfordshire and would have to drive into the zone every day". Tory MP Eric Pickles, shadow minister for London, led a small group protesting on Tower Bridge, describing the charge as an "unfair tax". The Brentwood and Ongar MP said: "It is cutting communities in two and does not tackle the real problems of London's infrastructure". Mr Livingstone has already admitted if the technology behind the scheme failed he would scrap it. An extra 11,000 spaces on buses into central London have been created. But a report last week warned most intended to use the Tube, despite the closure of the Central Line and the Waterloo and City Line following the derailment on 25 January. It is hoped the charge will raise £130m in two years towards improving London's public transport in a city where average speed has fallen to 10mph. Conservative mayoral candidate Steven Norris said he would concentrate instead on better traffic regulation. "It shifts a lot of traffic around but it doesn't actually reduce pollution, it doesn't actually reduce the number of vehicles significantly overall, and it does it at enormous cost to people who aren't necessarily wealthy simply because they run a car." "The real test for the charge could come later"
"If this all goes badly wrong, there is nobody else to blame"